Laurel is using Smore newsletters to spread the word online. Henrico county is a beautiful county located in Virginia. It is 245 square miles and it was founded in 1624. That makes it 389 years old! Don't be fooled by its age though, because Henrico has many places to see and things to do. You'll never be bored! Now where exactly is Henrico in Virginia? Look at that! Henrico is right over there! 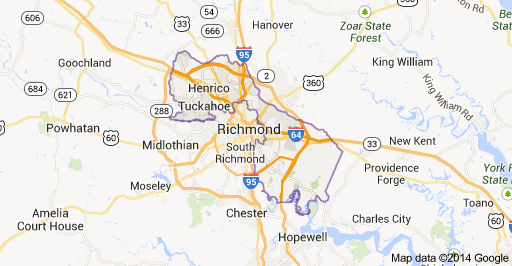 It's right next to the city of Richmond. Do you see it? Great! It's a little hard to see though, let's get a closer look. That's much better! You can now clearly see Henrico! Wow! It looks pretty big! I bet Henrico has a LOT to offer you! Let's go learn about it some more! Now, as you now know, Henrico is pretty old. That doesn't mean that you overlook it! You should take the time to explore as Henrico has SO many things to do and see! After all, over 300,000 people live in Henrico. With all the people here, you know that Henrico has SOMETHING to offer, since so many people live here. Henrico is a rural/suburban place to live. It's such a nice place to live. It can get pretty quiet at night, and you know you'll need that sleep after the fun filled days you'll be having here. Henrico is FILLED to the brim with historical places. You just know that the kids would LOVE to see it! Seriously this stuff is pretty cool. Sometimes when you're driving, you can see these different looking signs outside. That's a historical marker. It talks about something historical that happened there. If you're in the passenger seat, you'll have a better look at the sign. Read it for your enrichment. I mean, you'll learn something new that you can tell the other people in the car. Henrico schools are AMAZING. They have some of the best schools in the state. There are 71 schools in Henrico. So you know that lots of kids are learning every day!